But this is too bad. Lard (masť) was a popular cooking ingredient of our European and American predecessors. Despite the negative image of this natural shortening, lard actually contains less saturated fat than butter by weight (source Wikipedia). 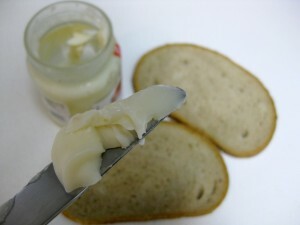 Lard used to used in baking, for frying, and as a substitute for butter. It is this substitute for butter that is still very popular throughout Slovakia. Visit a traditional Slovak pub (such as my dad’s restaurant in Banská Bystrica), and there is a good chance you’ll be offered a free appetizer consisting of bread topped with salted lard (chlieb s masťou). This popular beer snack is served in fashion similar to chips and salsa in Mexican-themed restaurants in the US. Below you’ll find the “recipe”. Lard is nothing more than solidified bacon fat rendered during making of pork cracklings, or when frying bacon. Instead of dumping the grease, save it in a glass jar, and place in the fridge overnight to solidify. Then just use it wherever you would use butter. Spread the lard on bread the same way you would butter, add few shakes of salt, enjoy. If you want, you can also top the bread with slices of onions or chives (pažítka, pictured here). Some people even mix in paprika, similar to how the bryndza spread is made. Enjoy with beer or whenever you are in the mood for a snack. Have you ever tried bread with lard? What do you think? Let me know. I remember eating it as a child. Nobody really thought how unhealthy it was:) It’s often made with diced sausage, onions and herbs. If you happen to come to Poland you can get home made bread with lard and sour cucumbers in traditional Polish restaurants. Yes, I have had lard and bread. When I was young bread and lard with sugar sprinkled on was a great treat. People are really missing out on this one, i tried this with Zlaty Bazant beer, good combo. Totally agree! We should try to bring this beer snack to the US. That is too funny! My Father always told us how his Zeto use to eat lard on bread. I don’t think any of the family members are aware that it’s a regular occurrence in Slovakia. I can’t wait to tell my father about this! Oh yeah, bread with lard is delicious. It may not sound too appetizing but you gotta try it. 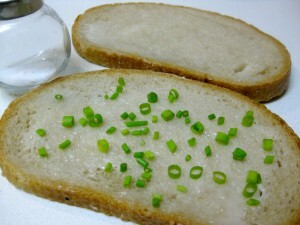 Just save the bacon fat next time you fry bacon, let it solidify overnight, and spread on good dark wheat or rye bread. My Grandparents came to Americam from Slovakia, about 1902. They raised 7 children in Gary, In. My Mother always used to tell me about eating the fat from a goose & spreading it on a piece of fresh bread! lol needless to say I thought it was FAT! But now I see where it was very common & considered a delicacy. OY ..who knew! Mom was right!… I’m confused because their Birth Cert’s. say they were born in Austria? Would the borders have changed back then? Slovakia..Austria? What’s up with that. Hi Ed, Czechoslovakia didn’t exist before 1918. Slovaks who arrived to the US before then were often labeled as Hungarians, since Slovakia belonged to the “Hungary” part of the Austrio-Hungarian Empire. The Czechs and Moravians were part of the Austrian side. So perhaps your family was from the Czech lands – or perhaps they just said Austria because they identified with that culture more than that of the Hungarians? By the way, speaking of fat, I just finished reading an amazing book, Mindless Eating by Brian Wansink, who is a professor at Cornell doing food research. One of his findings was that (just as I suspected) low-fat food makes us fatter. Folks participating in the research were offered two versions of the same treat – one labeled low fat, and one “regular”. Except they were exactly the same treat, just in different packaging. The people given the low fat variety ate on average 47 percent more, which translated to almost 100 calories – or 10 pounds gained over the course of a year. Gloria and I just got back from Slovakia. At a place called Zbojnicka Koliba near Poprad we had nearly this same treat but with a bryndza spread. I can’t begin to tell you how great it was! Yes. But maybe the onions were less or they were sliced quite fine. The restaurant owner dramatically spread the bryndza on the bread then “slapped” it down onto a plate of more thinly sliced onions. Probably green onions. It was heavenly. Tried it the first week I was here in Budapest and have been eating ever since…. great stuff! I tell all my American relatives/friends that it is just a spread when we see it at parties here.. they eat it, love it, then when they evetnually find out it is lard freak out…. oh the fools. Regarding arriving in the US in 1902… As mentioned Slovakia was not a recognized country then, the Kingdom of Hungary in the Austro-Hungarian empire was. For better or for worse they technically could not say they were from Slovakia. Just like my friends back in Boston from Sarajevo… they were never recognized when they moved to the US as being Bosnia, but rather as Yugoslavian…. Anyway, glad you enjoy this treat! But I gotta admit, it’s hard to get people to try it, there is something about the word “lard” that makes people squeamish. My mother told us stories of her family eating lard on bread and she had fond memories of this. I think she said they did this due to living through the depression, not due to custom. I haven’t tried it, but it does sound appealing. As in the previous posts, my grandmother, a Slovak, said she was Austrian or came from Austria, can’t remember which. I remember my father eating lard on his bread as well. In fact, he use to dunk bread in the bacon drippings even before it solidified. He use to call it “macha” or maybe “mucha” I think. Carl,“macha” could be “machalka”, ie ” máčať ” in Slovak means to dunk, or dip, as in dunking donuts in English. Machalka ( máčalka)would be something you can dip into. My dad always complained that there was not enough of macalka in this ot that. He loved to dunk his bread. My born in Slovakia wife remembers this from her childhood. She recommends purple onions and the lard should be home made–not from the store. I lived in Slovakia for several years this was common in pubs, but slightly different. The bread was similar in size to a French baquette, lightly toasted, rubbed with a garlic clove then the ‘skvar’ as it was called ( cracklins) spread on it then salted. And yes followed by a pivo was nice. the texture of skvar took some getting used to but not that long! Hi Carla, I just grabbed some rye bread in my local grocery store – it’s hard to find bread as good as what we have in Slovakia here in the US. And I know what you are talking about with the cracklings! I love that paste. It’s made by grinding pork cracklings. The same paste is also used for making what I called bacon biscuits. Wow, that brings back memories. This is soooo delicious! Sometimes we eat it with sauerkraut. I am from Romania and many of the recipes on this website are familiar to me. In the western part of Romania, there are a lot of people of Slovak origin and lard is very popular there. Lard or Fat is HEALTHY; it is full of digestible nutrients: unlike synthetic margarines or hydrogenated oils turned into solids. I too grew up eating lard and frying in lard; we ate real butter too. My cholesterol is about 143. I grew up in Slovak countryside and I used to eat it as a child and I still love it (although of course only cca twice a year 🙂 ). Lard recipe, says below but nothing there.